BS Super Mario USA is a four-part downloadable version of the American Super Mario Bros. 2, released in Japan as Super Mario USA. This version is based on that of Super Mario All-Stars, with the addition of golden Mario Statues; collecting these fully refills the player's energy and awards a 1-Up, aside from raising the score. Super Mario Advance brought back the idea of points, and resurrected the Mario Statues as Yoshi Eggs. Possibly more leftover graphics, like the warp screen, the ending, etc. BS Fire Emblem, BS Harvest Moon, and BS Dragon Quest all have leftover content from the SNES games they are based on, namely music and possibly other things (does BS Panel de Pon?). All of the original SPC music, aside from the death and warp jingles, were disabled in order to play Soundlink streamed audio. 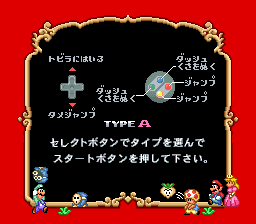 Setting RAM address 7E1DE2 to 01-13 will play any of the tracks from the SNES version. This page was last modified on 13 February 2019, at 09:20.